Massive game for Hamburg. Win and I can't see them getting caught in the race for promotion. HSV really need to get a result tonight, but im not too confident. I think this one will open up and we will see a few goals. If Cologne win, they are champions elect. Table topping Bundesliga 2 clash. All about securing second now for HSV. They play Union Berlin away in a fortnight so ideally need at least a.4 point cushion going into that one. They've got Union and Paderborn still to play away so even a win tonight won't settle anything. FFS. Gonna end up finishing 3rd i fear. No idea how Koln aren't winning this yet! Hamburg are lucky the teams fighting for 3rd keep dropping points otherwise they'd be in real trouble. Looked like HSV could play all night without scoring, then they scored. Also got 3 of the bottom 5 to come. I'm still confident of 2nd. That point could be massive come the end of the season. Well, it is a billy! True, on paper it should be ok but things rarely go to plan for HSV. Great point tonight though. Never seen it, was backshift but feared the worst after seeing this thread! Not a good thing if they're still in relegation battles, it's almost better to be playing somebody better with nothing left to play for. Fingers crossed, though. 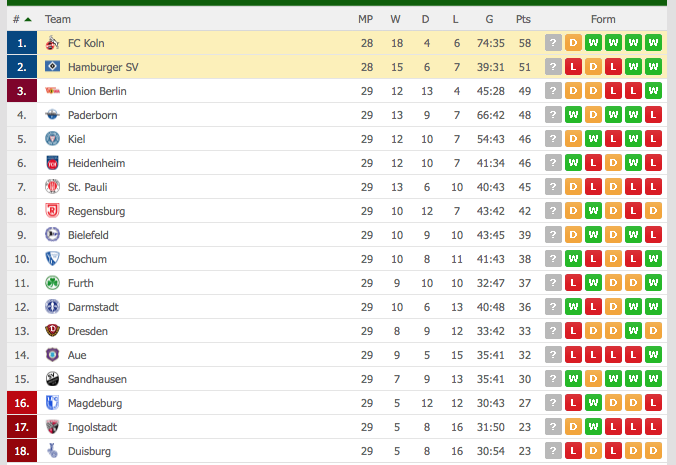 There's a great chance that Ingolstadt and Duisburg will already be relegated. Aue might be tricky. Next game up and if they get a result then they should be safe. Mir Stonn Zu Dir, effzeh Kolle!!! Would expect some serious strengthening will be required if promotion is secured, though not sure of just how strong a financial position HSV are in. Presumably a return to the top flight will help massively given tv money etc. They'll rebuild, a lot of players will go.